. Now, you have another tool in your arsenal. Looking to promote your latest video? Trying the new feature called InVideo Programming. InVideo Programming allows you to feature a video across your entire video library. In addition to featuring videos, you can also promote your channel branding. If you change your branding in the future, you can replace it with a single update. The best part is, your InVideo Programming travels with your videos wherever Video Annotations are available. Launch a new show/series: Launching a new series? Use “Feature a video” to showcase a new video to drive some initial traction. Reinforce channel branding: Make sure your viewers are aware of your channel branding. Use “Feature your channel” to promote your logo across your library and make it easier for viewers to visit your channel page and subscribe. Over the coming weeks, we’ll launch reporting to give you the ability to track the performance of your InVideo Programming, and we'll make UI enhancements to help you give your viewers more context behind your promotion. Michael Rucker, YouTube Product Manager, recently watched "Halo 4: Forward Unto Dawn - Part 1". Programming tools like annotations help you drive longer watch times. Now, you have another tool in your arsenal. Looking to promote your latest video? Trying the new feature called InVideo Programming. RichardGaleFilms is October’s YouTube Partner On The Rise! , which is YouTube’s “On The Rise” spotlight partner this October. Richard’s channel is featured today on the YouTube homepage, thanks to your support and his strong channel optimization efforts. A three-time Emmy award winner, Richard has been writing, directing, and producing films and TV shows for decades. His work spans a variety of genres including documentaries, suspense thrillers, parodies and comedy, as well as horror. Richard’s most recent project, the comedic horror short film, ‘The Horribly Slow Murderer with the Extremely Inefficient Weapon,’ has received multiple film festival awards and driven his YouTube viewership as well. The short film’s legacy lives on in a YouTube mini-series about the main character, Jack, and you'll just have to check out the channel to see how the story evolves. I became a YouTube partner almost by accident--as a filmmaker making shorts for film festivals, I had a 10-minute comedy about a killer with a spoon (Horribly Slow Murderer) that had completed its festival run, and I uploaded it to hopefully give it some additional exposure. To my astonishment, the short went viral, and was seen by more people in one day than in a year of film festivals. So we expanded the story into a series, and it continues to develop a dedicated following. We are extremely grateful to all of our awesome fans and supporters, who voted for our channel and continue to enjoy our films. Thank you!!!!! We've got exciting things on the horizon, so stay spooned! Congrats to Richard Gale from RichardGaleFilms, which is YouTube’s “On The Rise” spotlight partner this October. Richard’s channel is featured today on the YouTube homepage, thanks to your support and his strong channel optimization efforts. Can’t tune in? Don’t worry - we'll also post the episode on youtube.com/partnersupport after the show. On Monday, October 29th, the YouTube Partner Support team will be hosting a Partner Meet-Up in New York. The event is at capacity so if you’re not able to join us in person you can tune in at youtube.com/partnersupport. We've started adjusting the ranking of videos in YouTube search to reward engaging videos that keep viewers watching. This is a continuation of ongoing efforts to focus our video discovery features on watch time, and follows changes we made to Suggested Videos in March, and recent improvements to YouTube Analytics. The experimental results of this change have proven positive -- less clicking, more watching. We expect the amount of time viewers spend watching videos from search and across the site to increase. As with previous optimizations to our discovery features, this should benefit your channel if your videos drive more viewing time across YouTube. Yesterday, we added new Time Watched reporting to YouTube Analytics, so now you have even more tools to evaluate the performance of your videos and channel. So keep making great videos that your fans will love and share, and encourage them to discover more of what YouTube offers, and you’ll see your own fan base grow, too. Understanding what your audience likes is key to building a successful YouTube channel, so we've created more tools to help you interpret the performance of your videos. 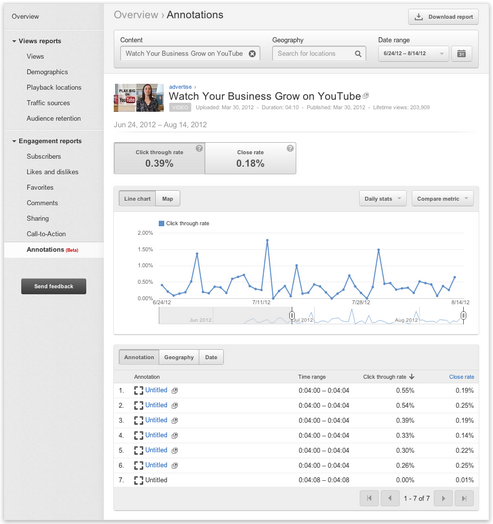 Here are some improvements we’ve made to YouTube Analytics in the last few months. Earlier this year we started focusing on the time users spend watching YouTube when we suggest videos. To give you additional insight into engagement for your videos, we’ve enhanced the “Views” report to show more time watched data. The metadata section for your videos and channels instantly provides you with data such as lifetime views and video duration. Ted Hamilton, YouTube Product Manager, recently watched "Drone". since we launched Content ID, it has helped everyone from large media companies to up-and-coming creators manage their content when it appears on YouTube. More than 3,000 content owners have supplied more than 500,000 hours of reference files to the system. Content ID hasn’t stood still over the last five years. We’ve been rolling out regular updates and we want to highlight three particular efforts that we think improve Content ID for everyone. Users have always had the ability to dispute Content ID claims on their videos if they believe those claims are invalid. Prior to today, if a content owner rejected that dispute, the user was left with no recourse for certain types of Content ID claims (e.g., monetize claims). Based upon feedback from our community, today we’re introducing an appeals process that gives eligible users a new choice when dealing with a rejected dispute. When the user files an appeal, a content owner has two options: release the claim or file a formal DMCA notification. Content owners have uploaded more than ten million reference files to the Content ID system. At that scale, mistakes can and do happen. To address this, we’ve improved the algorithms that identify potentially invalid claims. We stop these claims from automatically affecting user videos and place them in a queue to be manually reviewed by the content owner. This process prevents disputes that arise when content not owned by a partner inadvertently turns up in a reference file. Smarter claim detection minimizes unintentional mistakes. Of course, we take action in rare cases of intentional misuse, up to and including terminating Content ID access. At the heart of Content ID is the matching technology that identifies partners’ content among all the videos on YouTube. Earlier this year we introduced a significant improvement to how the matching happens. We continue to work on ways to make the matching more precise through better algorithms and a more comprehensive reference library. There is still a lot of work ahead of us, but we believe that these are significant steps forward in our efforts to keep YouTube a vibrant place where the rights of both content owners and users are protected and everyone can control their original content and make money from it - money which can be put towards the production of more great content. For now, keep on watching, upload a video or two and please, please keep the feedback coming. Thabet Alfishawi, Rights Management Product Manager, recently watched/danced to "Psy - Gangnam Style." In the nearly five years since we launched Content ID, it has helped everyone from large media companies to up-and-coming creators manage their content when it appears on YouTube. More than 3,000 content owners have supplied more than 500,000 hours of reference files to the system. Content ID hasn’t stood still over the last five years. We’ve been rolling out regular updates and we want to highlight three particular efforts that we think improve Content ID for everyone. and on Google+ at http://goo.gl/Ncxer. We'll give plenty of time for Alex and Jason to share their stories and advice, but we'd love to make sure they answer your questions as well. If you have questions about either of their histories on YouTube, or want to ask their advice about how to grow your channel and audience, please submit your questions here: http://goo.gl/qpZNv. Sherif Hamdy, YouTube Partner Support, recently watched "'Gangnam Style' Mom and Son!" We're excited to announce that the Partner Support team will be hosting the second session in our series of Hangouts On Air with past “On The Rise” featured partners. Please join us this Wednesday, October 3, at 10am PT while we chat with Jason Munday and Alex Carpenter. Jason and Alex are both accomplished YouTube partners whose videos showcase their musical endeavors. We’ll be chatting with them about their experiences on YouTube and how they’ve grown their channels, and we'll moderate your questions for them as well! A usual, we will be live streaming the hangout on the YouTube Partner Support channel and on Google+ at http://goo.gl/Ncxer.